With a surge in popularity in recent years, cross trainers, also known as elliptical trainers, can give a good cardio workout. But, choosing the right one can be a difficult task – especially as there is so much choice online. 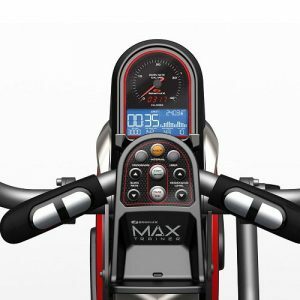 Top of our list is the Bowflex Max Trainer M5, which at over £1000 is at the high end of the market. 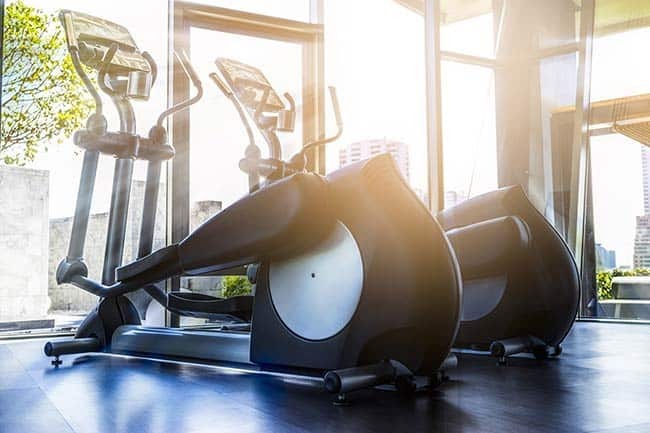 Combining the benefits of the elliptical and the stair climber in one machine, you’ll certainly be in for a challenging workout. However, this is one of the biggest benefits of the M5 as each 14 minute workout can allow you to burn 2.5 times more calories than on a standard elliptical, and it’s low impact too. In addition to this, the M5 is also able to link up with your smartphone via Bluetooth. Essentially, this means that you’ll be able to sync workouts which is a particularly useful option for those who use fitness apps to keep a record of their exercise routines. For each of these reasons and more, the M5 is our choice for the best high-end trainer. Generally, you will get what you pay for. However, no matter what your budget is, we are here to help you make the right choice – whether you have £100 to spend or if you can stretch out to over £1000. So, read on, and you’ll find out everything you need to know. 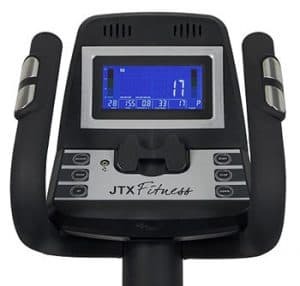 With a variable stride length of between 16” – 20”, multi-user set up, 12 pre-programmed routines and more, the JTX Tri-Fit gets our pick for the best Under £1000. If your budget extends to this price point, then you are going to get a premium product with this particular model. Electro-magnetic resistance ensures that you get smooth operation with every stride, and this is helped further by the 17kg flywheel. Bluetooth connectivity is a great bonus feature, as this allows you to follow interactive routes on an an external device such as a tablet and monitor your workouts too. This equates to a fantastic experience and you really do get a lot for your money with the JTX Tri-Fit. It’s safe to say that we were very impressed with this unit, and it comes highly recommended by us. With a substantial 16kg flywheel, 16 levels of resistance, and 16 built-in workouts, it’s safe to say that we were very impressed when we reviewed the Hammer Crosstech XTR. The built-in workouts are great for beginners, and they form a great basis to get you started. Adjustable loads are available on 12 of the profiles, whereas the other 4 allow you to stay in the target heart rate range. In turn, this leads to optimal calorie burning and we really liked this feature. As well as this, the multiple levels of resistance allow you to gradually move onto more challenging workouts. Combined with the hefty 16kg flywheel, we found that this was definitely one of the best features of the Hammer Crosstech XTR as the smooth operation meant we were able to take part in our workouts comfortably without any issues. However, the fact that there’s no bottle holder and it is more suited towards beginners means that more advanced users might be better looking elsewhere. 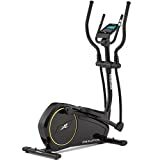 Made by one of the leading manufacturers of fitness equipement, JTX is undoubtedly a reputable brand which is renowned for its plethora of well made and easy to use range of fitness machines. The JTX Strider-X7 is certainly no exception to this, and it is a best-seller in the mid-range category. It’s easy to see why this is the case. After all, it is a sturdy and durable machine which comes complete with a touchscreen on-board computer, 21 built-programmes, a 16” stride length, and 16 levels of resistance for a range of challenging workouts. Although, the downside that we identified is that the hand pulse sensors aren’t always accurate. In spite of this, the JTX Strider-X7 is a great all-rounder at this particular price point, and comes recommended by us if your maximum budget is around the £500 mark. 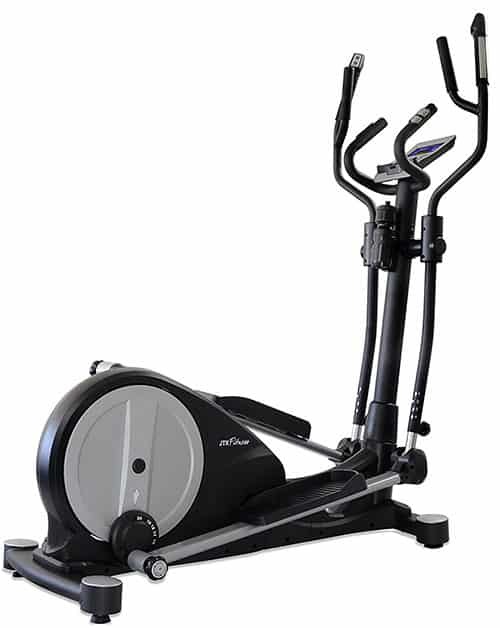 For a detailed review of the JTX Strider-X7 see our detailed review. 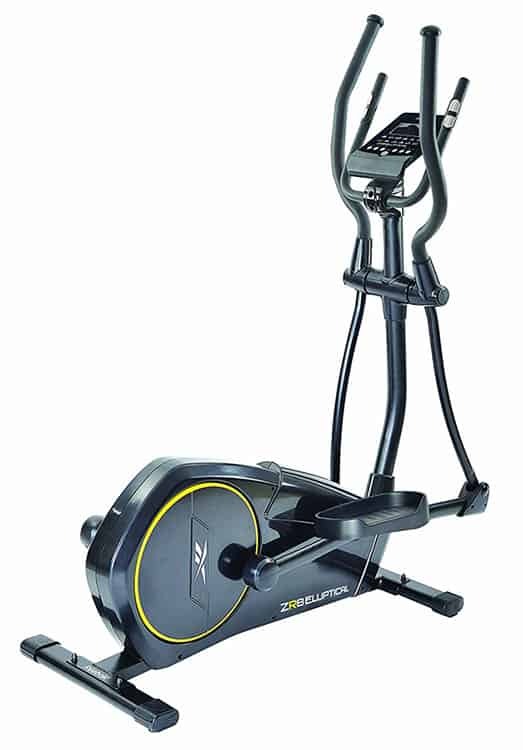 JTX Strider-X7 MAGNETIC CROSS TRAINER. 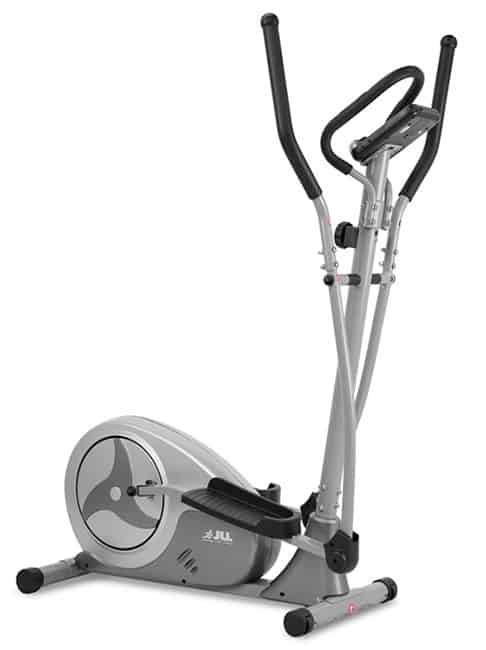 Featuring a 9 function on-board computer, a 5.5kg flywheel, and multiple resistance levels, the JLL CT300 is an affordable option for those with a slightly larger budget than our sub £100 recommendation. Combined with built-in heart rate sensors and a tablet holder, the JLL CT300 is certainly a great option at this price point. 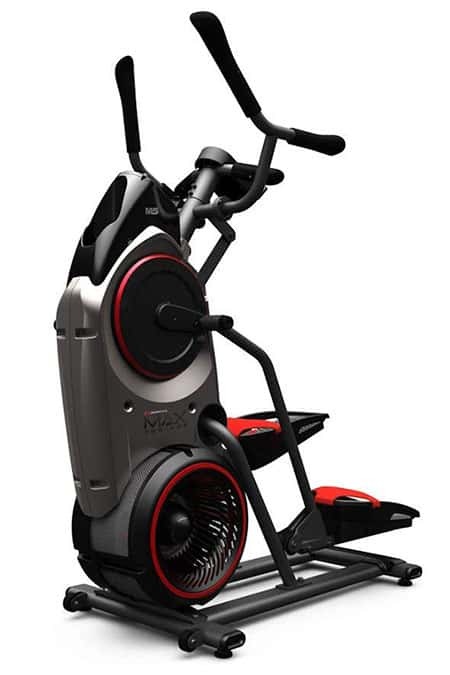 We found that it offered a great range of resistance levels and operated smoothly thanks to the 5.5kg two-way flywheel. However, there are no built-in workout programmes available. That certainly isn’t a deal breaker though, and it gets our choice for the best model under £300. Our JLL CT300 review takes a closer look if you want to know more. 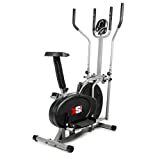 If you have a limited budget but would still like to purchase an elliptical, then you’ll find that the Pro XS Sports 2 in 1 is a great choice machine on a tight budget. Coming in at less than £100, this particular model is a great entry-level machine – perfect for those who are looking for something that gets the job done at a low cost. 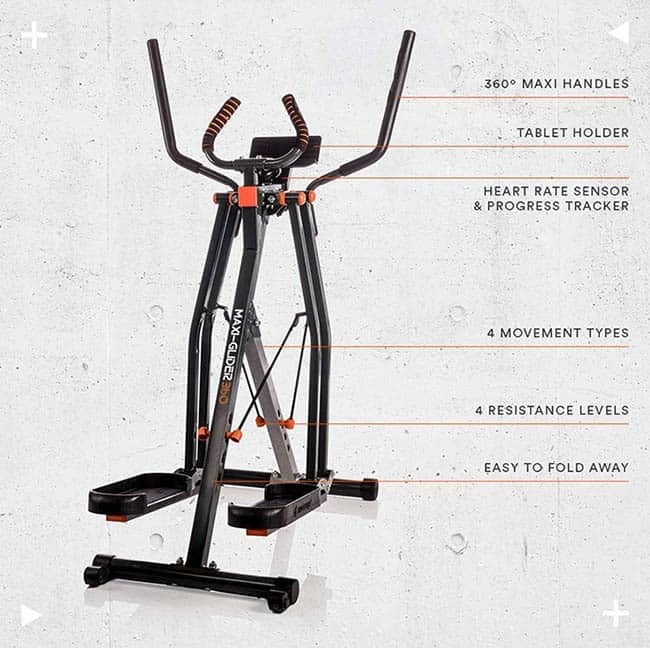 Adjustable resistance on this particular model ensures that you can adjust the tension to your liking – depending on whether you are performing a high or a low intensity workout. The resistance is controlled using a tension dial, a chain driven flywheel, and belt resistance which is often used on entry level models. The maximum user weight comes in at 110kg. This is less than some of its competitors which are often around the 130kg maximum weight mark. 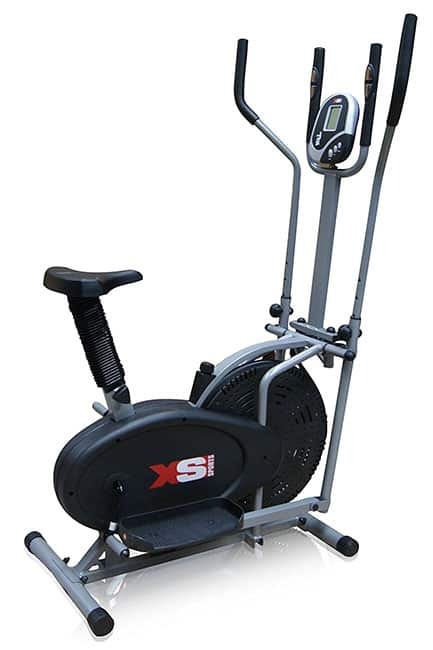 One of the biggest benefits of the Pro XS Sports is that it is a 2 in 1 machine. Essentially, this means that this model comes with an adjustable seat. 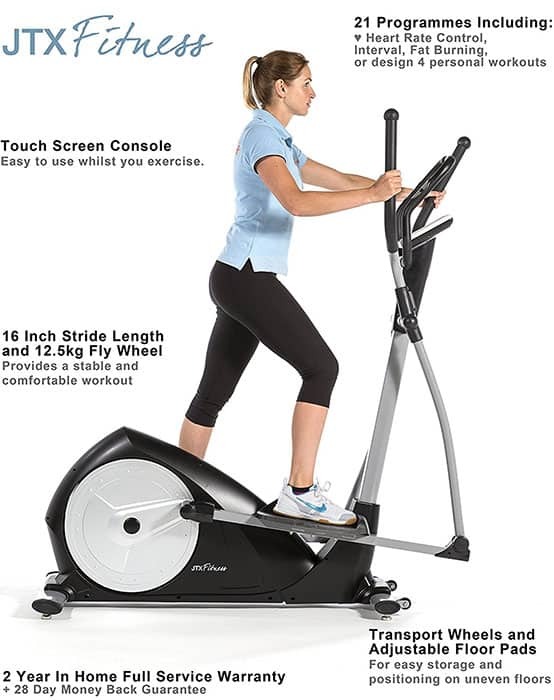 This allows you to use the machine as a stationary bike too, which adds to the appeal of this trainer. Furthermore, there is also an LED display which measures time, speed, distance and calories. It also measures heart rate too using the hand sensors – displaying your pulse rate on the screen. You can pay extra to have the product assembled professionally, but this will push the cost beyond £100. Expert assembly costs around £40, but if you can stretch out those extra few pounds it is definitely worth it. However, if you choose to assemble it yourself, you can rest assured that full comprehensive instructions are provided. 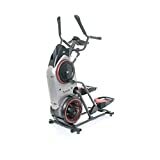 If you are looking for exercise equipment that is even cheaper and compact then a stepper machine is a good option. For those who are in search of a machine that also folds away for easy storage, the Maxi Glider 360 might well be the option you are looking for. It allows you to get a full body workout by utilising 10 major muscle groups. So, for overall calorie burn, this gives it the edge over other options such as the treadmill which places more stress on the joints. Four different types of movement including a 360 rotate, glide, ski, and split are a major selling point of this model, and it comes in at a reasonable cost at less than £130. For those who are short on space and looking for a budget-friendly and easy to move unit, this is certainly a fantastic choice. The fact that the Maxi Glider 360 comes complete with a tablet holder is a nice added bonus too. This allows you to store your device in a convenient place so that you can watch videos while you work out. Reebok might be known for its renowned sportswear range. 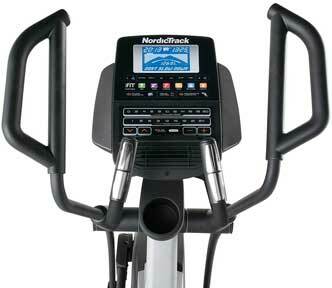 But, they also produce a range of fantastic fitness equipment too. The Reebok ZR8 is just one of their cross trainers – coming complete with 12 pre-set workout programmes and 32 levels of resistance. This is perfect for adding variety into your workouts and allows you to increase the difficulty as you become more advanced. Therefore, the Reebok ZR8 is a fantastic option for home users and claims the title for our recommendation for the best home cross trainer. For starters, it is an affordable option from a reputable brand – coming in at less than £200 which is great if you have a limited budget. The maximum user weight comes in at 120kg too, which is decent for a mid-range model. If you’re willing to put in the graft and assemble it yourself, then you can save yourself money. However, the biggest drawback is that assembly most definitely isn’t the easiest. So, if you don’t really know what you’re doing, you might just find putting the product together a difficult and time-consuming task. Thankfully, there is an option to have the product assembled by an expert. However, this comes in at an additional cost of around £40 which might push you beyond your budget. In spite of this, we’d definitely recommend going for this option as it can save you so much time and effort and you’ll know that it has been put together properly. You can take a closer look at this model in our Reebok ZR8 cross trainer review. 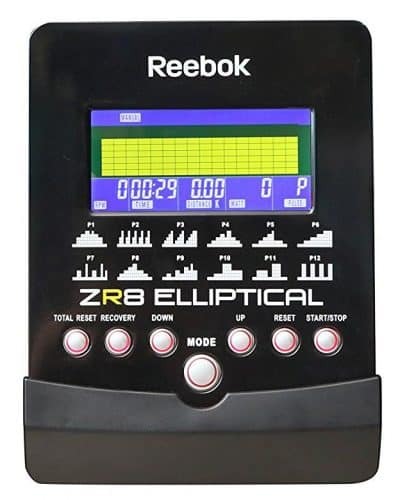 Update: there is a newer version of this model available: the Reebok ZR9. There are plenty of things that you need to look out for. In this section, you’ll find out everything you need to know. This is an important feature to consider. This is because a smaller stride length is typically more beneficial for those who are starting out and in search of a lower intensity workout. However, if you are looking for a more intense workout, then a bigger stride length is exactly what is needed. A stride length of between 16”-21” is optimal if you’re in search of a more difficult workout. But, even if you are a complete beginner, this gives you more room increase difficulty over time as you become more advanced. At the lower end of the scale, a belt is often used for resistance. These are generally low quality so they might not be as robust or be able to stand the test of time. However, mid-range to high end range models often feature a flywheel which offers a greater range of resistance. As well as this, they are far more likely to handle regular use for many years. Adjustable resistance is an absolute must. This is because having control over your workout gives you more freedom to work at a level which you are comfortable with. Or, conversely, it allows you to challenge yourself so that you can get fitter over time. The top machines out there offer you multiple levels of resistance. They can either be controlled digitally using an on-board console, or a traditional dial. The on-board console option is likely to be available on higher end options. Although, they can also be found on cheaper models too, albeit with more basic functionality. In high end models, the resistance is often controlled by electro-magnetic resistance. But, this can vary depending on the actual model itself. This is generally the most effective and efficient form of resistance. However, motor-based resistance systems allow you to control the resistance via the on-board console. So, this is a handy feature when compared to a standard mechanical control knob. 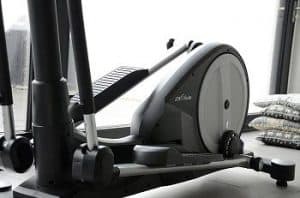 If you are hoping to make your workout experience as comfortable as possible, it is important to pay attention to the stride of the cross trainer. An unstable or jerky motion is sure to make for an unpleasant workout. Therefore, it is advisable to ensure the drive train is of a high quality and that the weight of the flywheel is substantial enough. If you’re looking to purchase a flywheel based unit, then it is a good idea to stick to one with a flywheel with an absolute minimum weight of 5kg. This is to ensure that it runs as smoothly as possible. Most cross trainers nowadays feature what is called an on-board console. This is a small computer type device that looks a little like a cycle computer that you would attach to a bicycle. While its features are often limited on budget models, they usually provide information which allows you to track your workouts. This includes the option to track the length of your workout, speed, distance, and even calories burned. Some units even come complete with a heart-rate monitoring function. The heart-rate sensors are usually placed either below the on-board console or on the handles which you hold while working out. External heart rate monitors can even be linked to certain models. Although, you will usually need to purchase one separately. On-board consoles can also feature built-in workout programmes too. This makes a change from the standard resistance levels available on more budget options. This will help add more variety to your workouts and even track your progress. A good quality trainer will typically have a maximum user weight of around 130kg (20 stone). If the maximum user weight is around this figure or above, then this typically suggests that the build quality of the machine is decent. The stability is also something which you should consider. The last thing that you want to happen is for the machine to tip up during use. So, effective stabilisers are needed to ensure that this doesn’t occur. Having easy access to your sports equipment while exercising is most definitely a bonus feature when choosing the best model for you. While features such as a bottle holder and a tablet/phone holder are most definitely not essential, this can be hugely beneficial when working out. A place to hold your phone or tablet is handy as you will be able to watch videos and/or listen to music throughout your workout. Furthermore, having easy access to a drink will help you stay adequately hydrated throughout your session. 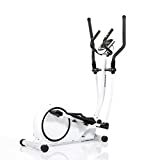 If you are looking to get a great cardio workout, then you’ll find that a cross trainer is absolutely ideal for exactly that. Not only will you be able to burn a high number of calories, you’ll also be able to work the entire body while taking part in a low-impact exercise. Therefore, your joints will be protected which gives it the edge over alternative fitness machines including the treadmill. In addition to this, you will be able to easily adjust the intensity of your workout too. You can do this by adjusting the resistance of your machine. This makes them perfect for all levels of ability – whether you’re a complete beginner or more of an advanced user. How Many Calories Can You Burn? As you will be working your whole body, it’s possible to burn a high number of calories – whether it is a high intensity interval training session or a steady state cardio routine. The moving handles means that you will utilise muscles in your upper body. However, to burn a higher number of calories, it is best to keep the intensity to a medium-high level. In terms of actual numbers, you can often burn up to 240 calories in a 30 minute session. Although, this varies on the intensity of the workout. 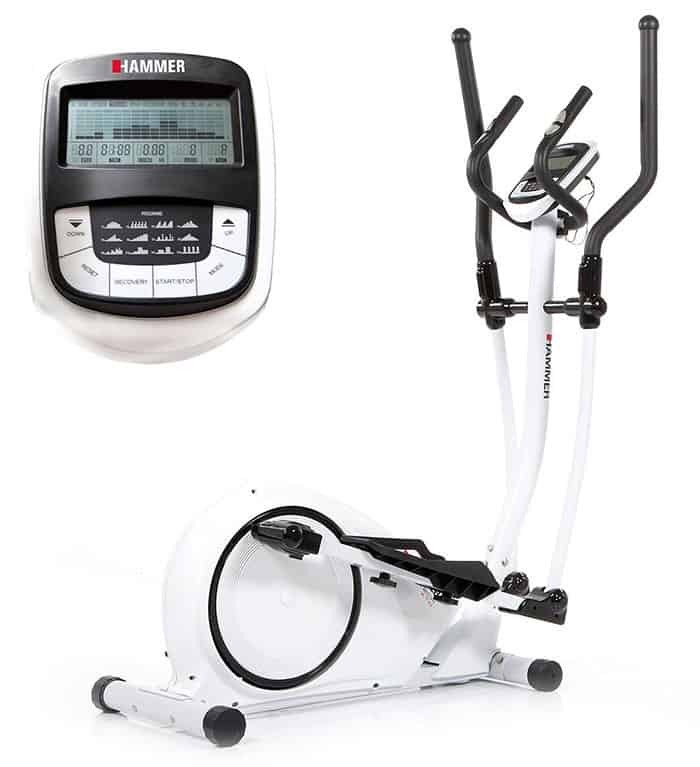 As we mentioned previously, the cross trainer provides a fantastic workout which utilises muscles in the whole body. In terms of the lower body, it will work your hamstrings, quadriceps, and the glutes too. This will allow you to tone these areas effectively and it supplements lower body weight training exercises such as squats and the leg press nicely. In addtition, it also works the upper body too. This includes the chest, back, biceps, and triceps. With each revolution you perform, you will be utilising pushing and pulling movements in these muscle groups – that’s if you hold onto the moving handles. 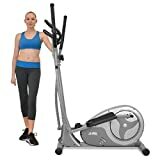 Overall, if you are looking to increase your fitness levels and are in search of the perfect cardio workout alongside your weight training, the elliptical is a great option. If your priority is to build muscle then a home multi gym may be a better choice. What is Better, a Cross Trainer or a Treadmill? Both are two hugely popular methods of getting a cardio workout. However, the cross trainer has the edge in terms of overall calorie burning potential. This is because it works muscles both in the lower and upper body, meaning it’s a great way to increase your heart rate and help those who are looking to lose weight. An added bonus is the low impact movement. This means that there is less stress on your joints when compared to using a treadmill for example.